So I intentionally went from one bike back to two and then accidentally three. Only two can stay, so I figure why not make a thing out of the comparison? The Wilier. Sitting as my second most successful bike - at least in terms of how many miles I've put on (the count which is now 20+). I love this bike. It's the most comfortable aero bike I've ridden and the handling still surprises me often (in a good way). There have been a few times on fast, familiar descents that I thought I got it wrong - only to look back and the ride data and see that I was just travelling several MPH faster than I ever had previously. Why look for a mistress? Enter the Dogma. My first ride on this, I actually got off the bike 3x to see if the back tire was flat as the rear end is so compliant. I'm only about 400 miles into this bike but I've enjoyed the heck out of it and enjoy the look of it more every day (bordering on obsession). -It's super comfortable. Top 3 I've ridden. -I didn't mean to! I was shopping for wheels! The Mosaic. Caley Fretz's RT1 is probably the bike that kicked off my interest in titanium. I've dreamt of a custom ti bike with integrated seat mast for years as my real "one bike to rule them all." Even as I'd settled in happily with the Wilier, I always told myself that if I found one secondhand that had a reasonable shot of fitting - I'd own it. Fortunately, that time came when I was back to being OK with two bikes. Less fortunate that I happened to have two bikes that I was really pleased with. So what to do? Compare them all and winner has to find a new home! -One very technical 1.85 mile descent right by my house. It's wooded which means there are often wet spots, leaves, or gravel on the road. With any of these - you don't have a chance at taking the crown on this descent. There's enough tree canopy that Garmin often doesn't follow the road - which doesn't help things. I'm quite confident in my handling ability - and this is the only descent I can think of that I've honestly tried (and tried) to KOM and haven't been able to. Still sitting 4s off the top. Last edited by Imaking20 on Sat Apr 06, 2019 8:16 pm, edited 2 times in total. Gorgeous bikes to say the least. Just for the sake of curiosity. How do manage 2 bikes with different drivetrain (Campy vs Chitmano)?? I will assume you have dedicated wheels for each bike and do not swap them between the 2. Why even bother with 2 different brands in the first place? I'll admit it's a bit of a struggle going from perfect shifting to riding Campy - which is why I'd picked up another 9150 group to put on the Dogma. I apologize if this offends, and my opinion means little to others beyond myself.... but the wavy design on the dogma offends my eyes. Call me shallow, but that is the bike I would drop, purely on looks. Cool thread, looking forward to the end results but I have no Dog in this fight, not yet. Even though I’ve never been a big fan of the curvy Onda stays, I do like the simple white/black tonal qualities and basic (sort of) traditional lines of the frame. In contrast, dropped seatstays make me ill, especially when they’re coupled with rim brakes since they wreak havoc on obtaining a nice smooth line of the brake housing from the top tube to the calipers themselves. 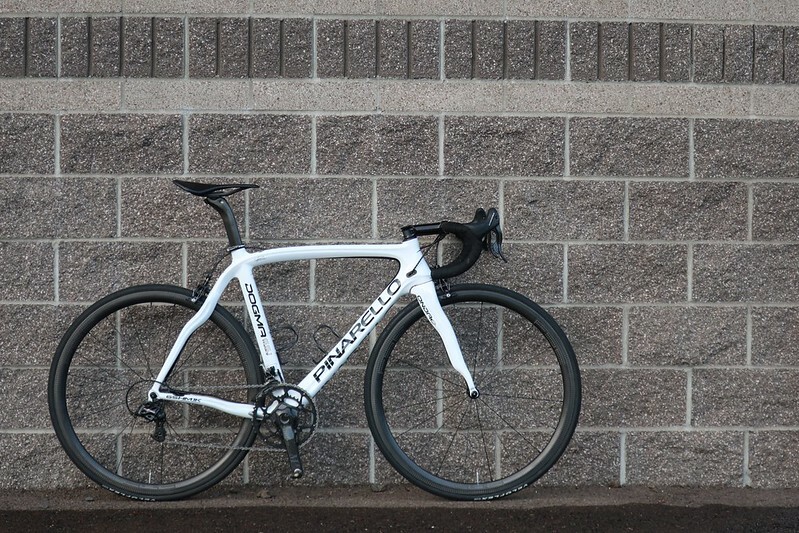 My vote is to keep the Pinarello. I predict the Mosaic will lose on ride quality alone. The ISP on the Mosaic just screams a harsh ride! In my own experience a skinny 27.2mm seatpost with setback gives a velvety ride. IMHO a non-racy Ti bike for those mellow days should have a sloping TT which allows a longer exposed seatpost. Coupled with a skinny 27.2mm setback post will bring out the best qualities of a Ti bike. It's not really a fair test to compare a custom bike built for someone else as a true representation of how it could ride. If you did an RT-1 for yourself you could copy the geo of the Wilier to match the handling aspects you love about it. Then depending on tube selection you can tune the ride to be however how want it to be, within limitations of the frame materials. Bye Mosaic. Custom bikes not built for you are generally bad. The front end is a good amount taller than your other bikes. How many outdoor miles have you put on the Wilier? What does it mean to have a mistress...in 2019? Willier. I enjoy one, it got many km too. Difficult to beat. What kind of wheels do you have in the garage? I think it's interesting with wheel match to bike. A plush bike marries well with stiffer wheels, while a stiff frame might feel better with wheels not über stiff. Same with a super fast steering bike, i think they feel more affected (cross winds) by deeper aero wheels. Got any pics of the mosaic?